A medical identification tag is a small emblem or tag worn on a bracelet, neck chain, or on the clothing bearing a message that the wearer has an important medical condition that might require immediate attention. The tag is often made out of stainless steel or sterling silver. The intention is to alert a paramedic, physician, emergency department personnel or other first responders (emergency medical services, community first responder, Emergency medical responder) of the condition even if the wearer is not conscious enough, old enough, or too injured to explain. A wallet card with the same information may be used instead of or along with a tag, and a stick-on medical ID tag may be added or used alone. A type of medic identification alert is the USB medical alert tag, essentially a USB flash drive with capacity to store a great deal of emergency information, including contacts and medical conditions. This information is accessible by any computer with a USB port. However, the practical effectiveness of such a system is limited in many cases by medical computer systems that restrict the use of USB devices which may carry malware. It is also possible that a device carried by an unconscious person may not be their own, or not be up to date, with concomitant risks to health and legal liability of medical personnel. Another new type of medic identification alert is QR code based medical alert stickers. The QR code on the sticker links to a web service that contains the individual's emergency information. The information is accessed by any first responder or emergency personnel by scanning the QR code by using a smartphone. Since a web service is used to store the information there is normally no limitation of how much information that can be stored. In addition to mention of the relevant medical condition(s), the tag may have a telephone number that medical personnel can call for more information, for example that of physician, care-giver or next of kin. Where applicable and provided, the wearer's national health service user number can enable access to a more detailed case history. Basically, the medical information tag, engraved with the wearer's personal medical problem or history, speak for the wearer when the wearer can't. Incidentally and where the symptoms can mislead, such a tag may also be useful as evidence of such a condition to law enforcement personnel. 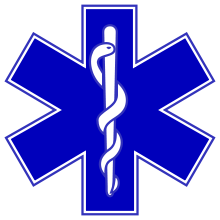 The emblem for medical emergency services in some countries, the Star of Life, features a rod of Asclepius. There are various types of medical ID available. The most common form of medical ID is jewelry which provides a logo or inscription indicating a particular medical condition. These medical identification tags can be made out of stainless steel (usually classified as 316L and known as surgical stainless steel), sterling silver or gold. If found by emergency personnel the inscription provides an indication of your special medical needs. Tags are available with pre-engraved conditions or can be custom engraved with your specific medical histories and have the benefit of that all information is self-contained and does not require any form of technology to view in case of an emergency. Another type of medical ID jewelry indicates membership in a medical information organization such as the MedicAlert Foundation, and American Medical ID. Such medical ID jewelry includes a member identification number and a toll-free number for medical emergency personnel to contact the organization and obtain full information about the wearer's medical conditions, treatment, and history. These organizations maintain a database of medical information on their members and can provide it to medical personnel when requested. The newest technology allows the user to carry stickers with an NFC Tag. A similar technology allows the user to carry stickers with a QR code. By scanning the NFC Tag or the QR code with a smartphone, you will reach the stored medical alert information. Apple's IOS 8 operating system includes the facility for a mobile phone to contain the owner's medical emergency information. Silicone bracelets, preprinted with a general medical condition or allergy, are also popular. The lack of personalization may be a deterrent. Recently patients have begun to "tattoo" their medical condition on their wrist or arm. Although a permanent tattoo might be considered, a temporary tattoo works as well. Other items include stick on tags that stick onto a driver's license, wallet, or cell phone which are practical for the person who does not want to carry something extra advertising their medical condition. Another type of medical jewelry is a pendant or wrist strap containing a wireless alert button, also known as a panic button, worn in the home as part of a wireless medical alert system. This type of medical jewelry sends a signal to a dialing console which contacts a medical alarm monitoring service or directly dials first responders when an emergency occurs. Devices marked "ICE" which can hold a significant amount of data and are readable by a computer are sold, typically USB flash drives with password-protected data entry providing read-only access to emergency medical data. However, it has been pointed out by a staff nurse with experience in trauma and critical care that such devices are worse than useless, at least in most situations in the UK, as medical computer systems are designed not to accept USB storage devices due to the risk of computer viruses. Additionally, there is no guarantee that ICE information even pertains to an unconscious person carrying it; using incorrect information can lead to patient harm and legal liability. ^ Chernecky, Cynthia C.; Berger, Barbara J. (2007). Laboratory Tests and Diagnostic Procedures. Elsevier Health Sciences. p. 620. ISBN 1416066837. Retrieved 8 October 2017. ^ "Medical ID Bracelets For Autism". Retrieved 10 February 2018. ^ Venes, Donald (2017). Taber's Cyclopedic Medical Dictionary. F.A. Davis. p. 800. ISBN 9780803659407. Retrieved 8 October 2017. ^ "The Medical ID That Comes With a Free Medical Profile". Retrieved 10 February 2018. García-Betances, Rebeca I.; Huerta, Mónica K. (17 May 2012). "A Review of Automatic Patient Identification Options for Public Health Care Centers with Restricted Budgets". Online Journal of Public Health Informatics. 4 (1). doi:10.5210/ojphi.v4i1.4011. ISSN 1947-2579. PMC 3615806. PMID 23569629.